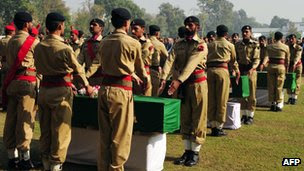 Pakistan Sunday buried soldiers killed as a result of air attack on a Pakistani check post by NATO attack helicopters early Saturday. Army chief General Ashfaq Pervez Kayani led mourners in funeral prayers at military headquarters in the north-western city of Peshawar. Although, NATO has apologised, calling it a "tragic unintended incident", and is investigating what happened, the incident has once again heightened already tense relations between Pakistan and the US and NATO.